The Caroline Bath Vanity Collection features a clean, shaker design that will enhance any bathroom. Five configurations ranging from 24" to 72" in width, a variety of finishes including warm white, cool gray, cashmere and deep espresso, marble or granite countertops plus a selection of sink basins, faucet and mirror options provide endless choices for every style and taste. Solid wood framing, sealed finishing, soft close doors and drawers make for lasting durability and reliability. 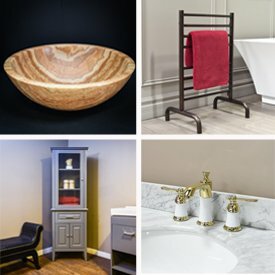 Exquisite design and artisan craftsmanship are the trademarks of Virtu USA. Let the Caroline Bath Vanity Collection add the virtues of style and value to your home.